It’s the Elks Sports Night, Wednesday, Aug. 26. There will be an all-girl tag team wrestling match. Names of those participating are Babs Wingo, Betty White, Kathleen Wimberley, and Ethel Johnson. Thirty-six rounds of boxing. Dusty Freeman vs. Ike Hart, ten rounds; Hoyt Nummaly vs. Baby Beans, eight rounds, and other matches, Tuesday night, 7 o’clock, at Herndon’s Stadium. Photo taken at wrestling matches sponsored by Frontier Club Monday evening at the Baltimore Coliseum shows the four participants and both referees tangled up. On floor, Mary Horton “suffers” from a scissors lock, while Katherine Wimbley on rope strand is getting ready to add to her torture by stomping with her bare feet. Also on floor is Babs Wingo. Other girl in tangle is Betty White who teamed with Kathleen in the team match. 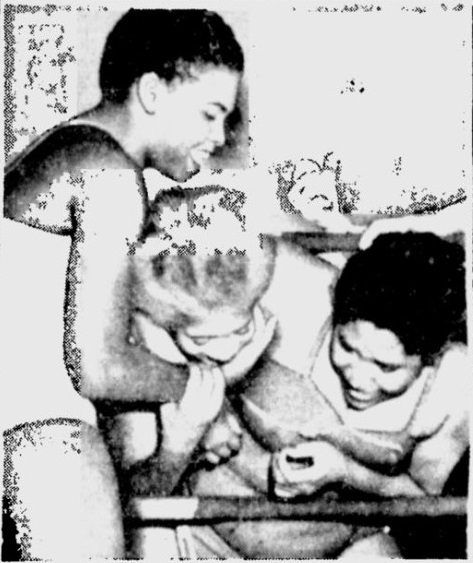 HERE BABS WHITE (left) and Mary Horton (right) are having “fun” putting a hammer lock and chin clinch on Betty White, who is everything but amused. A co-feature wrestling card has been scheduled for tonight at the Coliseum starting at 8:30 p.m.